A wolf spider bite is considered by many as a highly dangerous and painful experience. Due to its looks and habits, the wolf spider has earned a reputation of being a vicious predator and is even often mistaken for a tarantula. Though they should be taken seriously, wolf spider bites are not always as fearful as their reputation. It is therefore important to know some basic facts about the wolf spider, as well as knowing how to identify a wolf spider bite and what treatment it requires. What Does a Wolf Spider Look Like? To identify a wolf spider bite, it goes without saying that it is helpful to know what a wolf spider looks like. The wolf spider is often mistaken for a tarantula because it is similar in appearance. Wolf spiders are also mistaken for nursery web spiders, but wolf spiders do not spin webs and their bodies are more robust than nursery web spiders, which are generally thin with pointed rear ends. A wolf spider’s best identifying characteristic is its number and arrangement of eyes. A wolf spider has 8 eyes arranged in 3 rows. There are 4 small ones on the bottom row, 2 large very prominent ones on the middle row and 2 medium ones on top of the head. The 2 biggest eyes also glow in the dark. Also useful for identification purposes is the fact that a female wolf spider will carry its egg sac or baby wolf spiders on its back. The most prominent feature and characteristic to use for wolf spider identification, however, is the eyes. After being bitten, fang marks and tearing of the skin might be present, particularly if a large wolf spider is the culprit. Often, however, there is simply redness and swelling in the area. The number one sign of being bitten by a wolf spider is generally the pain that comes with it. The pain may last for up to 10 days together with swelling in the surrounding area, and swelling of the lymph glands. In some cases, the skin around the area of the bite may darken in color. A bite from a wolf spider is venomous but is not considered to be fatal. They are not like spider bites from the dangerous black widow, hobo, and brown recluse spider in terms of the damage and harm presented to humans. In some severe cases, the bite can become infected and this can lead to complications. To prevent this from occurring, proper care and treatment of wolf spider bites must be implemented. After identifying wolf spider bites symptoms, proper care and treatment must be carried out to prevent complications from the spider bite. 1. Like all wounds, bites from wolf spiders must be washed and cleaned. 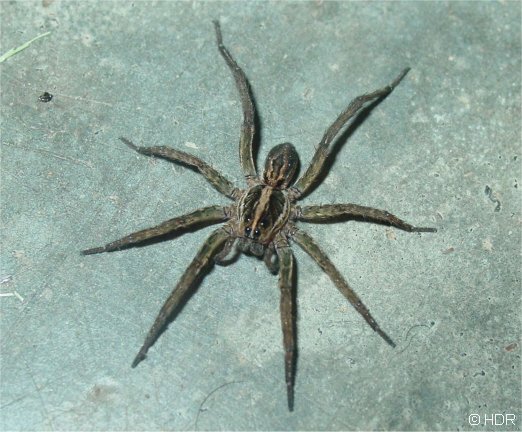 An antibiotic ointment may be applied to kill bacteria which may have been introduced by the wolf spider through its bite. 2. Place a cool or cold towel over the area to minimize pain and swelling as well as the spread of the venom. 3. Monitor the progress of symptoms and note any complications. 4. In the case of high fever and development of other symptoms other than those in the table above, contact your physician as soon as possible. 5. Take note of any tissue death or development of a lesion on the area around the bite. It might be possible that the spider has been misidentified. If so, seek immediate medical attention . Usually, wolf spiders are not seen inside homes, except in autumn and winter when they are seeking warmer places to shelter. They are active hunters and do not spin webs to catch prey. They stalk their prey or pounce on it using their very fast reflexes and agility. This, of course, adds to the fear-inducing false information that circulates about them, with many people believing they deliberately try to bite humans. A wolf spider bite usually happens because of ignorance on the part of the human, and fear on the part of the spider. Contrary to popular urban legends, a wolf spider does not set out to bite humans. However, when a wolf spider is afraid or startled, or feels that it is threatened, it will bite without hesitation. A wolf spider bite is certainly painful and might be a traumatic experience for the individual. However, a wolf spider bite looks much scarier than it really is, just like the spider which caused it. If you see a wolf spider, try and avoid disturbing it to avoid being bitten in the first place. Although wolf spider bites are generally not as dangerous as the bites of the hobo, the black widow or the fiddleback spider, it is still better to err on the side of caution. Being knowledgeable about the wolf spider bite and knowing how to identify and treat it is the best thing you can do to be prepared in the event of a bite from a wolf spider.